Are you struggling with a cold or sickness? Are you afraid to take medications for fear of harming your breastfeeding baby? Having a cold at any time in your life can be miserable, but treating one while nursing is a unique experience. Every single thing you put in your body has the potential to affect your baby — we know that can be nerve-wracking. Feeling under the weather can create a lot of questions for you. How do you know if it’s a cold or the flu? What are some safe cold remedies during breastfeeding? Are there natural alternatives? Rest easy and read on mama, we’ll have you feeling better and back on your feet in no time. Should I Take Medications While Breastfeeding? What Are Some Natural Cold Remedies? Both influenza and the common cold are viral infections that can leave you feeling under the weather. If you start feeling symptoms, especially as a new mom, it’s important to determine which one you have. A cold will go away on its own and doesn’t usually result in more complicated health issues. However, the flu can lead to serious complications, including pneumonia and even death (source). Sometimes causes a runny or stuffy nose. Sometimes causes an itchy throat or a mild cough. Rarely causes fever and headache. If you have a cold, there’s unfortunately nothing your doctor can do. The upside? Colds usually last a shorter time than the flu, and there are things you can do to manage it at home — we’ll get to those in a minute! Commonly causes fevers, aches, and chills. While you might have a runny nose and sneezing, it’s not as common as it is with a cold. Influenza can be diagnosed with a simple swab test by your doctor. Depending on how fast you are diagnosed, they might prescribe you an antiviral medication. This won’t cure your flu, but can shorten it by several days. In severe cases, you might be hospitalized so you can be monitored closely. You might be tempted to say “no” to taking medications, since many over-the-counter solutions were off the table during pregnancy. The fact is, it’s much different to take medication during pregnancy than it is while you’re breastfeeding. When you’re pregnant, you share a blood supply with your baby via the placenta. In most parts, the placenta is only one cell thick (source). It does a great job of keeping germs away, but the chemicals that come from medication pass through it easily. Taking medication while breastfeeding is a different matter. Unlike the placenta, many chemicals do not pass into your breastmilk at all (source). What’s more, many of those that do pass through are diluted and safe for your baby. It’s always best to check with your doctor before taking any medication while breastfeeding. They will help you weigh the risk, taking your health, your baby’s health and your medical history into account. Let’s look at the safety of some common medications moms might consider taking while breastfeeding. Acetaminophen is a fever reducer and pain reliever — it’s the active ingredient in Tylenol. 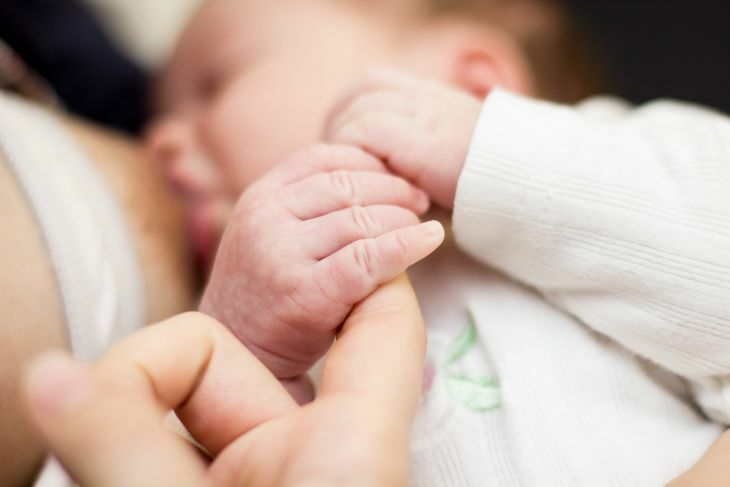 This medicine does move to your breast milk, but the levels are lower than the recommended dose for infants, making it a safe choice for your relief. Ibuprofen is a fever reducer, pain reliever, and anti-inflammatory found in Advil and Motrin. It passes into breast milk, but at levels safe for infants (source). Generally, antihistamines are safe for breastfeeding mothers and can help with your runny nose and sneezing. Still, you should choose non-sedating antihistamines over the sedating variety (source). Sedating antihistamines have been known to cause sleepiness in both you and baby. They should only be used under a doctor’s supervision. Coughing can be one of the most annoying symptoms when you have a cold. It can keep you awake and make you sore. Maybe it even wakes your baby! So you might think about taking a cough suppressant. Pseudoephedrine: While this may not harm your baby, the use of pseudoephedrine has been shown to decrease breast milk production (source). So medications with this ingredient should be used only as a last resort. Codeine: Not recommended for breastfeeding mothers. This is because mothers are ultra-fast metabolizers (source). Metabolizers turn codeine into morphine at a rapid rate, and this can result in morphine being administered to your baby with dangerous results. Benzonatate: Benzonatate has not been proven harmful to milk supply or breastfeeding babies (source). Still, there’s not a lot of research done on the medication, so it’s recommended you avoid it while breastfeeding. Dextromethorphan: Dextromethorphan is also thought not to be harmful to your baby or your milk supply (source). But like benzonatate, this medication has not been studied sufficiently, so it is still recommended you avoid it if possible. Guaifenesin is the active ingredient in many expectorants. No studies are showing how much of this medication secretes into the breastmilk, nor how it affects breastfeeding infants (source). Because of this, it’s recommended breastfeeding mothers avoid it, if possible. Aspirin is not recommended for breastfeeding mothers because of the risk of causing Reye’s Syndrome — a rare but very serious disorder — in children (source). Reye’s Syndrome can cause permanent damage to your baby’s brain and liver. Maybe you’re wary about chemical compounds. Or maybe your symptoms are on the mild side and you want to try something natural first. Natural remedies can be a great way to help relieve the symptoms of a cold, making you more comfortable and maybe even shorten its duration. When you have a cold, your immune system is in overdrive trying to fight off the virus. This can be nothing short of exhausting — especially if you’re up in the middle of the night with baby! While you’re sleeping, your body is not only recharging; it’s also actively fighting off the infection. Try to make sure you get as much sleep as you can to enjoy the full restorative effects! Perhaps someone else can take care of babies needs (except for feeding) while you rest. Or tuck yourself and your baby into bed and do nothing but rest. Vaporizers and humidifiers add moisture to the air, which may help with the cough or itchy throat that can come with illness. Humidifiers release cool mist, while vaporizers release steam into the air. Doctors recommend cool mist humidifiers for homes that have small children, to reduce the risk of the child being burned by putting their face in the steam or knocking the vaporizer over (source). Make sure to clean out and thoroughly dry your humidifier each day. This prevents mineral, mold, and bacterial buildup that could be harmful to your family. Zinc gluconate is a commonly recommended cold remedy, considered safe to use while breastfeeding (source). Zinc works by stopping the rhinovirus from multiplying. In many cases, zinc has been shown to reduce the duration of a cold by up to a day, especially when taken within the first 24 hours of symptoms starting (source). Zinc nasal sprays have been shown to cause permanent loss of some people’s sense of smell. Instead, it’s recommended you take it in lozenge or liquid form. Neti pot devices look like little teapots. Don’t grab the milk and sugar just yet — you’re not going to want to drink out of this one! Neti pots might sound gross, but they can be immensely helpful for relieving congestion and sinus pain. Since it’s simply a nasal flush, you’re not ingesting anything when you use it — no chance of anything passing into your breastmilk. While steam has not been shown to relieve chronic congestion, many still swear by its results when suffering from a cold (source). Steam is supposed to help thin out the mucus your body is holding on to and help it drain, relieving the pressure and headaches that can come with congestion. Pour boiling water into a bowl, and place your face over the bowl while covering your head with a towel. Breathe in for several minutes. Do this several times a day when suffering from a cold to relieve symptoms. When we’re sick, we often don’t feel hungry or thirsty; but, our bodies need a certain amount of fluid each day to clear toxins and function in a normal manner (source). Staying hydrated can also help with symptoms such as nausea and fever and help to clear secretions. It’s also essential for maintaining a good milk supply while you’re feeling ill.
It’s recommended that breastfeeding moms drink approximately three liters of fluid each day, but don’t be discouraged by that number (source). You don’t have to drink only but water from morning to night! It’s best to avoid caffeine, since caffeine causes increased water loss through your kidneys. Herbal remedies have been used for centuries to help treat cold symptoms. But are they safe for breastfeeding, and which ones can help which symptoms? Fenugreek: Has astringent properties and can help relieve chest and head congestion. Many women take it in tea or capsule form to help increase breastmilk production. It’s considered safe during breastfeeding (source). Anise: Helps break up congestion and ease tightness in the chest. It’s safe to use while breastfeeding, and can be used in teas or as part of steam treatment. This licorice-tasting herb should not be confused for Star Anise. Star Anise should be avoided during pregnancy and breastfeeding (source). Echinacea: Boosts your immune system, and is considered safe to use while breastfeeding. Often taken in capsule or tea form. With any herbal remedy, be sure to consult with your baby’s doctor and perhaps your own. While herbs are natural, they can have contraindications, side-effects and interactions with other medications. Vitamin and mineral supplements can be a great way to help get over a cold. They may also work as a preventative measure to keep you from getting sick again. Omega 3 fatty acids, for example, can help reduce inflammation while also improving your immune system (source). Vitamin D can help prevent viral infections, and vitamin C can help build your immune system. While these supplements are generally considered safe while breastfeeding, it’s important to take them under a doctor’s care. Having a cold is difficult for all of us, but having a cold and caring for a new baby can be daunting. Don’t fret though! While things such as aspirin and cough suppressants should be avoided, others like Tylenol are safe. You also have home remedies such as a Neti pot or a hot bowl of chicken soup at your disposal. It’s important to listen to your body — and your doctor if you’re unsure of anything. It’s normal to experience a dip in milk supply during a maternal illness. Once you’re feeling better, nurse more often or add some pumping to your routine for a few days. If you’re having trouble getting your supply back, seek the help of a lactation consultant. Have you ever had a cold while breastfeeding? Have tips to help other moms through it? Leave your ideas in the comments section below — we’d love to hear what you’ve got to say. Don’t forget to share this article with your friends and fellow mothers! We know it takes a village, and we’re happy to be a part of yours.